the chord at C; added to the altitude of the station H, 240 feet, the Birmingham station, H, would be, if the earth is a globe, 5640 feet above the horizontal datum D, D, or vertically above the Trinity high water mark, at London Bridge. It is found, practically, and in fact, not to be more than 240 feet; hence the theory of rotundity must be a fallacy. Sections of all other railways will give similar proofs that the earth is in. reality a plane. engraved upon its surface two intersecting lines, marking a point which was exactly in the vertical plane containing the axis of the tunnel. The instrument was formed of two supports fixed on a tripod, having a delicate screw adjustment. The telescope was similar to that of a theodolite provided with cross-webs, and strongly illuminated by the light from a lantern, concentrated by a lens and projected upon the cross-webs. In using this instrument in checking the axis of the gallery at the northern entrance, for example; after having proved precisely that the vertical plane, corresponding with the point of intersection of the lines upon the slab, also passed through the centre of the instrument, a visual line was then conveyed to the station at Lochalle (on the mountain), and on the instrument being lowered, the required number of points could be fixed in the axis of the tunnel. In executing such an operation, it was necessary that the tunnel should be free from smoke or vapour. 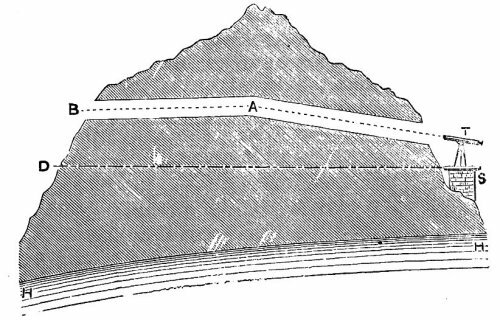 The point of collimation was a plummet, suspended from the roof of the tunnel by means of an iron rectangular frame, in one side of which a number of notches were cut, and the plummet shifted from notch to notch, in accordance with the signals of the operator at the observatory. These signals were given to the man whose business it was to adjust the plummet, by means of a telegraph or a horn. The former was found invaluable throughout all these operations. eye-piece without shifting the carriage. In order to understand more clearly the method of operating the instrument, the mode of proceeding may be described. In setting out a prolongation of the centre line of the tunnel, the instrument was placed upon the last column but one; a light was stationed upon the last column, and exactly in its centre; and 500 metres ahead a trestle frame was placed across the tunnel. Upon the horizontal bar of this trestle several notches were cut, against which a light was placed, and fixed with proper adjusting screws. The observer standing at the instrument, caused the light to move upon the trestle frame, until it was brought into an exact line with the instrument and the first line; and then the centre of the light was projected with a plummet. In this way the exact centre was found. By a repetition of similar operations the vertical plane containing the axis of the tunnel was laid out by a series of plummet lines. During the intervals that elapsed between consecutive operations with the instrument, the plummets were found to be sufficient for maintaining the direction in making the excavation. To maintain the proper gradients in the tunnel, it was necessary, at intervals, to establish fixed levels, deducing them by direct levelling from standard bench marks, placed at short distances from the entrance. The fixed level marks, in the inside of the tunnel, are made upon stone pillars, placed at intervals of 25 metres, and to these were referred the various points in setting out the gradients." gradients. Its horizontal surface, prolonged through the mountain, passed 445 feet below the summit of the tunnel, and 435 feet below the entrance on the Italian side. This entrance was 4381 feet above the sea, and 435 feet above the horizontal marble slab on the French side. 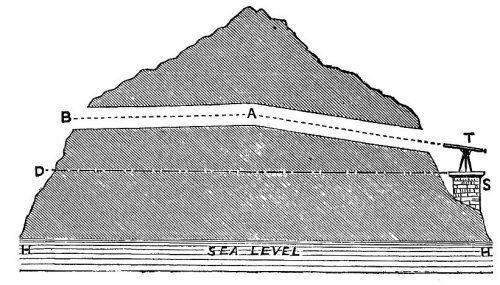 But, if the earth is a globe, the datum line from this horizontal slab would be a tangent, from which the sea-level would curvate downwards to the extent of 42 feet; and the summit of the tunnel, instead of being 10 feet above the Italian entrance, would, of necessity, be 52 feet above it. It is not so, and therefore the datum line is not a tangent, but runs parallel to the sea; the sea-level not convex, and the earth not a globe. This will be rendered plain by the following diagram, fig. 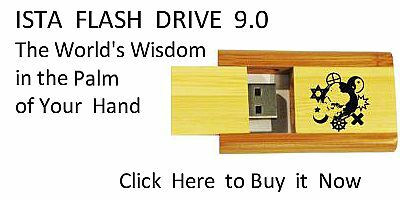 36.
would be 52 feet higher above the sea at H, than it is known to be; because taking D, S, as a tangent, and the length of the tunnel being 8 miles--82 miles x 8 inches = 52 feet. scientific men, there is a difference between theory and practice of 52 feet! Rather than such a reproach should attach to some of the most eminent practical engineers of the day--those especially who have, with such consummate skill and perseverance, completed one of the most gigantic undertakings of modern times--let the false idea of rotundity in the earth be entirely discarded, and the simple truth acknowledged, that the earth is a plane. It is adopted in practice, why should it be denied in the abstract? Why should the education given in our schools and universities include a forced recognition of a theory which, when practically applied, must ever be ignored and contradicted? [paragraph continues] Sea; and A, C, B, the arc of water connecting them; D, D, the horizontal datum, which, if the earth is globular, would really be the chord of the arc, A, C, B.
water in the Atlantic Ocean is convex--a part of a great sphere of 25,000 miles circumference--the horizontal datum line would be a chord to the great arc of water above it; and the distance across the bed of the Atlantic would therefore be considerably less than the distance over the surface. The length of the cable which was laid in 1866, notwithstanding the known irregularities of the bed of the Ocean, would be less than the distance sailed by the paying-out vessel, the "Great Eastern;" whereas, according to the published report, the distance run by the steamer was 1665 miles, while the length of cable payed out was 1852 miles. respectively; and shall be referred to some fixed point . . . . near either of the termini. (See line D, D; fig. 2.)" On the page opposite that of the above Standing Order, a section is given to illustrate the meaning of the words of the order--special reference being made to the line D, D, as showing what is intended by the words "datum horizontal line." The drawing of the section there given, and which is insisted upon by Government, is precisely the same as the sections recently published of all the great railways, of the Suez Canal, of the bed of the Atlantic Ocean, taken for the purposes of laying the Electric Cable, and of many other works connected with railways deep-sea ordnance, and other surveying operations. In all these extensive surveys the doctrine of rotundity is, of necessity, entirely ignored; and the principle that the earth is a plane is practically adopted, and found to be the only one consistent with the results, and agreeing with the plans of the great surveyors and engineers of the day. 48:1 Daily News, September 18, 1871. 56:1 Publishers, Vacher & Sons, 29, Parliament Street, Westminster.